Sidney Corbett, born in 1960 in Chicago, studied music and philospohy at the University of California, San Diego, Yale University, where he earned his doctorate in 1989 and from 1985 to 1988 at the Hamburg Academy of Music with György Ligeti. Corbett has lived primarily in Europe since 1985. He has been professor of composition at the University of Performing Arts in Mannheim since 2006.Corbett is an artist outside the boundries of avantgarde mainstream whose stance is nonetheless explicitly contemporary. His music is firmly established in the international music world and is performed worldwide by leading orchestras, ensembles and soloists. A particular emphasisi in his recent work has been in the area of music theatre. 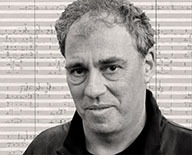 He has written five operas, among them NOACH, after a libretto by Christoph Hein (Bremen 2001), „Das Große Heft“ (The Notebook), after the novel by Agosta Kristof (Osnabrück 2013) and „Die Andere“ (The Other), again after a libretto by Christoph Hein (Magdeburg 2016). His literary leanings are also evidenced by his numerous song cycles and vocal works on texts by Christine Lavant, Barbara Köhler and Roland Barthes among others. Literary influences can also be found in his instrumental music, for example in „Yaël“ for violin and orchestra, which is inspired by the writings of Edmond Jabès or his Third Symphony, „Breathing the Water“, for soprano, trumpet and contrabass with string orchestra, which was premiered by the Staatskapelle Berlin and in which texts by Denise Levertov and Amal Al-Jubouri are juxtaposed.